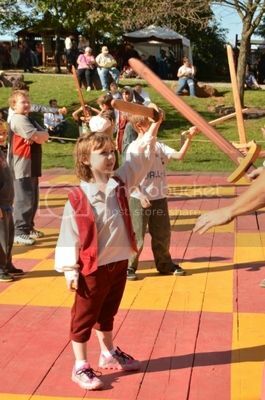 Thoughts of Scrapbooking: Renaissance Faire! Remember how I said yesterday that I would tell you what I have been up to? Well here it is! 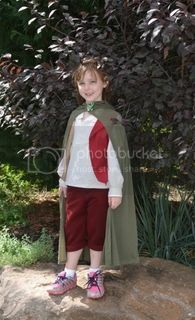 Ellie has been reading the Lord of the Rings books with her dad and is really into it, so she wanted to be Frodo the hobbit. Being the good mom that I am, I broke out my sewing machine and my previously meager skills and made this costume for her! 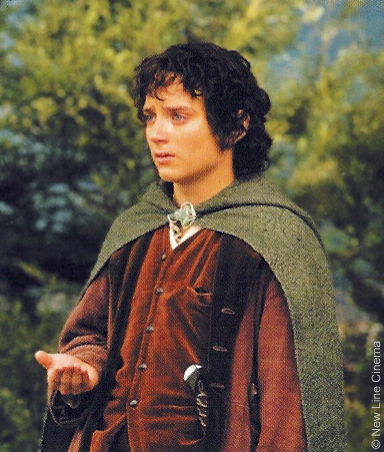 For reference, here's a pic of Elijah Wood playing Frodo in the movie. He has a coat on here over his vest and shirt but under his cloak. I skipped the coat because, really, isn't a cloak, a vest and a shirt enough? In the past, the pretty much home decor stuff, which is all straight lines. I made a footie pajama snow leopard halloween costume for ellie before she was born (she was born the day before Halloween), but it was WAY too big because seam allowances and I don't get along. So, I am REALLY proud of myself for making this costume. The pants were from a pattern that was for cargo pants, but I skipped the extra pockets, so she just has the two front standard slanted pockets. The cloak was not from a pattern at all, just instructions online, and look at that hood! Isn't that cute?! 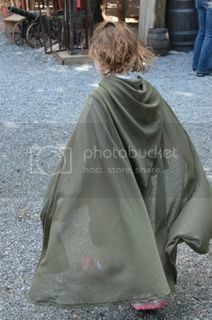 Look at how the cloak billows! I loved that! 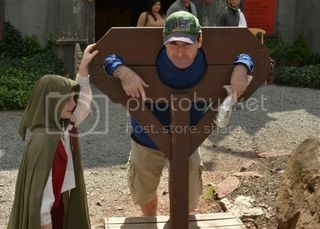 These pictures were from the first outing of the costume at the Renaissance Faire. We have to work on her hair more. She wanted it wavy, so I added some gel and scrunched and let her sleep on it wet, hoping to leverage her natural curl, but it ended up just looking dirty. Of course, Frodo was on a trek, so he WAS kind of dirty, but still... We are trying curlers next time. We had a GREAT TIME at the Renaissance Fair! Ellie and I learned how to Scottish peasant dance (it was scottish day). She learned to sword fight. (and bought a sword to add to her costume, so that now I have to make her a sword belt). We ate turkey legs, tasted wine, and shopped and shopped and shopped.